Not only does the Gold Coast attract over 12 million visitors a year, but it also draws around 12, 500 new residents. Both those statistics confirm that the region is one of the best in Australia and, if you haven’t yet visited, why not! If you are thinking of booking a vacation soon, now’s a great time to check out the amazing deals on Broadbeach holiday accommodation. Yes, even though the Gold Coast is now in its high season, it’s still possible to save a bundle. I’m talking about resort apartments, of course. I’m not sure about hotels, but I doubt they could beat some of the online deals I’ve seen, at places like the Phoenician Resort. 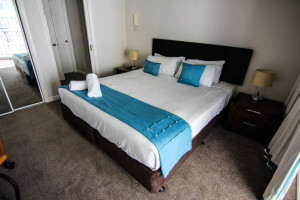 You can even find amazing offers on Broadbeach luxury apartments, when you check out the resort’s Specials page online. Whereas hotels used to be all the rage, an increasing number of visitors are now choosing apartments, for the space, privacy and flexibility. For example, for families, an air-conditioned two-bedroom apartment is brilliant. It can sleep up to six, and there are two bathrooms plus spacious living spaces. Best of all, there’s a fully equipped kitchen plus private laundry facilities. That sure saves a lot of hassle when you have kids! Of course, if you don’t wish to lift a finger during your break, but simply enjoy complete indulgence, that’s available, too! You’ll love sleeping and relaxing in your luxurious accommodation, and making good use of such excellent facilities, including swimming pools, spas, sauna, gym and more. The beauty of Broadbeach is that it is home to the Gold Coast’s most famous restaurant precinct, within walking distance of many of the resorts. There are so many different restaurants from which to choose, you could dine somewhere different every night and still not get through them all! Staying in Broadbeach also puts you within metres of one of the area’s very best beaches, as well as the foreshore and park. The park is the place to be on Sundays, when the very popular and colourful Broadbeach markets take place. It’s just the place to pick up some unusual and unique gifts and souvenirs. If you’re into shopping of a different kind, Broadbeach is also very convenient for Pacific Fair Shopping Centre, where you’ll find all the big brands. Equally close is the very famous Jupiters Casino. Even if you don’t fancy a flutter, it’s well worth a visit, just for its four fabulous restaurants and world class shows. Another great place to catch a show, exhibition or major event, is the Gold Coast Convention and Exhibition Centre, just across from the Phoenician Resort. It really is so easy to keep everybody happy when you book a break in Broadbeach! Broadbeach isn’t just about shops, restaurants and shows, though. It’s also the perfect location for nature-lovers and water sports enthusiasts. The area includes endless stretches of navigable waterway, making it perfect for canoeing and kayaking, especially for birdwatchers. And if you really want to get out amongst nature, head out of town to Tamborine Mountain and Lamington National Park – just perfect!